I've just begun the process of designing an Art Deco-inspired Wedding Invitation with this regal visual + sparkle = inspiration. Eliza, the bride-to-be, contacted me when she fell in love with the Frank Lloyd Wright-inspired Wedding Invitation I shared with you here, and as we talked more about her likes and wants and the venue (Oh the VENUE!!!!) I thought "wait, that's exactly the venue, colors, and decor I would choose for my Wedding!". You can imagine the fun I'm having with this inspiration. 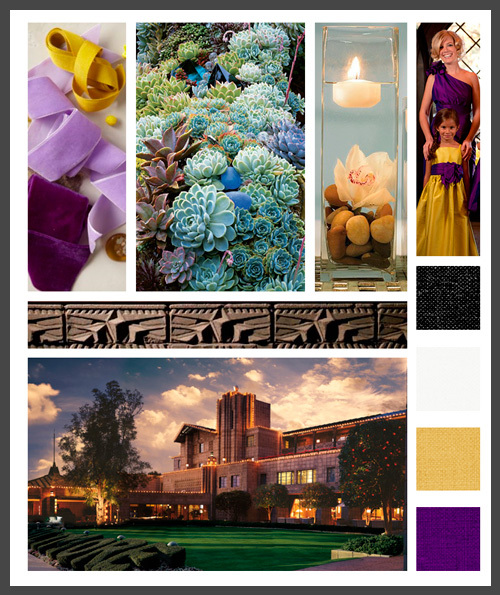 Enjoy the warm golden and purple hues of this visual board along with those geometric shapes of the Art Deco-inspired Arizona Biltmore...what could be more opulent and deco than that?! *these images provided by client.